From left: Partagás Corona Junior (Tubo), JFR Lunatic Short Robusto, My Father La Opulencia Toro, Partagás Serie P No. 2 (Tubo), Padrón Serie 1926 No. 1. We have just added 80 new cigar reviews to our extensive online tasting database, and many of them are exceptional, scoring 91 points or higher. The scores come from June’s Cigar Aficionado, and 18 of those handmade smokes earned a rating of 91 points or above, outstanding on our 100-point scale. Nicaragua, which is the largest importer of handmade cigars to the United States, produced the most 91-plus ratings in this tasting, with a total of eight cigars. 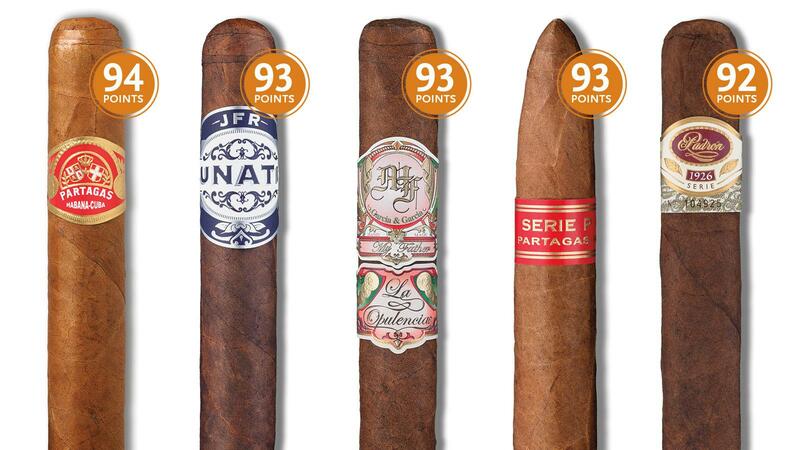 Cuba, though, produced five of the six highest-rated cigars in this issue, including the Partagás Corona Junior (Tubo), which was the top-scoring cigar overall with 94 points. The June tasting rated cigars in six sizes: Churchill, corona gorda, figurado, grande, petit corona and robusto. Of those, figurados performed best, with seven cigars scoring 91 points or higher. Our panel of editors consider four different categories as they determine a cigar's rating: Appearance and structure count for a maximum of 15 points; flavor and smoking characteristics (quality of draw, texture of smoke, etc.) count for 25 points each; and the remaining 35 points are allotted to the overall impression, or level of enjoyment, of the cigar. Partagás Corona Junior (Tubo) (Cuba, 94 points) The Corona Junior is one of two tubo-packed Partagás cigars to score 93 points or more in this tasting. See full tasting note. Cohiba Siglo VI (Tubo) (Cuba, 93 points) Cohiba Siglo VI was the first addition to the Linea 1492 (or Siglo Series) since the brand was released. It was also the first Cohiba to exceed a ring gauge of 50 and the first Cohiba to appear on Cigar Aficionado's Top 25 list, making its inaugural appearance for the best cigars of 2004. See full tasting note. H. Upmann Connossieur B (Cuba, 93 points) The H. Upmann Connossieur B began reaching global markets in April. Although introduced at the 2017 Habanos Festival, it didn’t start shipping until this year. The Connossieur B is made exclusively for La Casa del Habano shops and Habanos Specialists. See full tasting note. JFR Lunatic Short Robusto (Nicaragua, 93 points) JFR cigars are made in Nicaragua by Aganorsa Leaf, the company formerly known as Casa Fernandez. With a retail price of $5.98, it’s hard to find a better value cigar than this 93-point Nicaraguan puro. See full tasting note. My Father La Opulencia Toro (Nicaragua, 93 points) First released in 2017, La Opulencia is an old Cuban trademark that the Garcia family resurrected as an extension of the lauded My Father brand. The blend features a Mexican wrapper that the Garcias classify as rosado oscuro, two Nicaraguan binders—one Criollo and one Corojo—with various Cuban-seed fillers. See full tasting note. Partagás Serie P No. 2 (Tubo) (Cuba, 93 points) The Partagás Alphabet Series dates back to the 1930s, when the brand launched in the British market. The brand was discontinued in the 1960s but brought back incrementally in subsequent years. The Serie P No. 2, which debuted in 2005, does not follow the sequential A through E lettering format; rather P stands for “Pirámide.” See full tasting note. Punch Petit Coronation (Tubo) (Cuba, 93 points) Created in the mid-1800s, Punch is one of the oldest brands in Cuba's portfolio. Punch Tubos used to be silver, but within the last 10 year Habanos S.A. change the color to a glossy-dark green. See full tasting note. Arturo Fuente Hemingway Work of Art (Dominican Republic, 92 points) Arturo Fuente Hemingway debuted in 1983. Every size in the line is a figurado. At the time of its release, double-tapered cigars were uncommon in the marketplace—the elegant, shapely smokes were relics of an earlier cigar era. See full tasting note. Enclave Broadleaf Churchill (Nicaragua, 92 points) When Enclave Broadleaf debuted last year, it marked the first time cigarmaker A.J. Fernandez blended a broadleaf-wrapped cigar as part of his own portfolio. According to A.J. Fernandez Cigar Co., Fernandez was inspired to create Enclave Broadleaf after the Enclave Churchill earned a spot on Cigar Aficionado's Top 25 list of 2016. See full tasting note. Padrón Serie 1926 No. 1 (Nicaragua, 92 points) The No. 1 is the longest cigar in Padrón’s critically acclaimed Serie 1926 line, which is named for the birth year of late company founder José Orlando Padrón. See full tasting note. Trinidad Santiago Belicoso (Dominican Republic, 92 points) Trinidad Santiago is the reimagining of a classic Cuban brand as a Dominican puro. The tobaccos are grown in the Cibao Valley by José "Jochy" Blanco and made at Blanco's Tabacalera Palma S.A. factory. See full tasting note. Alec Bradley American Sun Grown Blend Churchill (Nicaragua, 91 points) Alec Bradley Cigars released this bolder version of its American Classic brand in 2012. American Sun Grown wears a sun-grown Habano leaf from the Jalapa region of Nicaragua, binder from Jalapa, and Estelí and Condega filler. See full tasting note. Hoyo de Monterrey Epicure No. 1 (Tubo) (Cuba, 91 points) Cuba’s José Gener registered the Hoyo de Monterrey brand in 1865 and the cigar has long been a major name in Cuban cigars. This Epicure No. 1 carries a box date of December 2015. See full tasting note. Joya De Nicaragua Antaño Gran Reserva Belicoso (Nicaragua, 91 points) Once a limited-edition cigar from 2005, the Joya de Nicaragua Antaño Gran Reserva did not become a regular-production cigar until last year. See full tasting note. La Aurora Reserva Especial 2008 Belicoso (Dominican Republic, 91 points) This Belicoso is a limited-edition smoke centered around Dominican tobaccos that La Aurora says are from an exceptional 2008 harvest. See full tasting note. Maestro del Tiempo 5712 (Nicaragua, 91 points) Maestro del Tiempo, or Master of Time, is a Nicaraguan puro from Warped Cigars. The cigar, which debuted in 2016, wears a light Corojo '99 wrapper from Jalapa, with binder leaf from Condega and fillers composed of Criollo '98 and Corojo '99 tobaccos. See full tasting note. Ortega Serie D Black Belicoso (Nicaragua, 91 points) Cigarmaker Eddie Ortega’s Serie D Black Belicoso wears an Ecuadoran wrapper leaf over Nicaraguan binder and fillers. See full tasting note. Project 805 Petite Corona (Dominican Republic, 91 points) Ventura Cigar Co.'s Project 805 is blended with an unusual type of tobacco known as andullo, a dark leaf that gets rolled up into long, dense cylinders. See full tasting note.